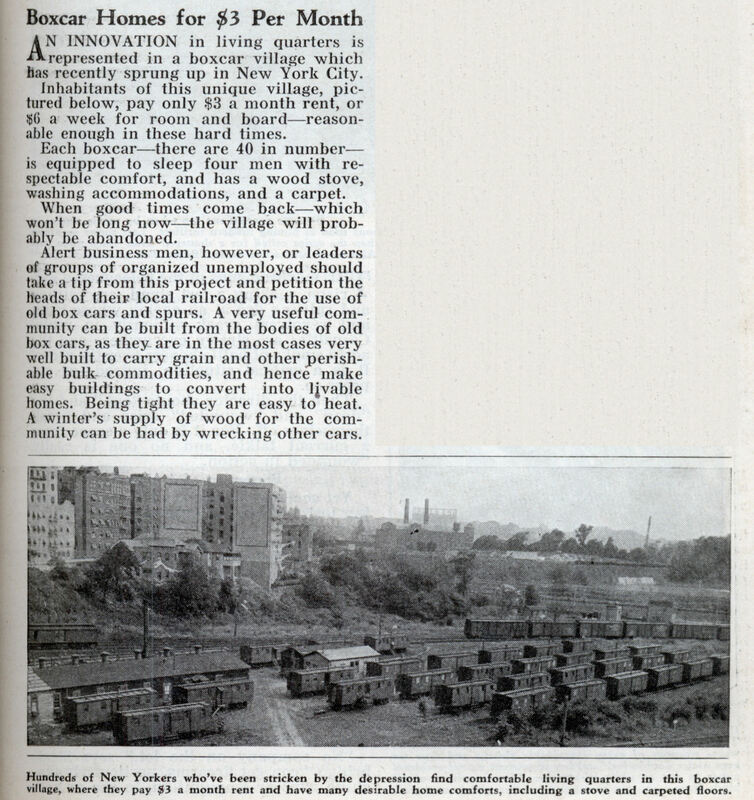 AN INNOVATION in living quarters is represented in a boxcar village which has recently sprung up in New York City. Inhabitants of this unique village, pictured below, pay only $3 a month rent, or $6 a week for room and boardâ€”reasonable enough in these hard times. Each boxcarâ€”there are 40 in numberâ€” is equipped to sleep four men with respectable comfort, and has a wood stove, washing accommodations, and a carpet. When good times come backâ€”which won’t be long nowâ€”the village will probably be abandoned. Alert business men, however, or leaders of groups of organized unemployed should take a tip from this project and petition the heads of their local railroad for the use of old box cars and spurs. A very useful community can be built from the bodies of old box cars, as they are in the most cases very well built to carry grain and other perishable bulk commodities, and hence make easy buildings to convert into livable homes. Being tight they are easy to heat. A winter’s supply of wood for the community can be had by wrecking other cars. Wow only $3.00 a month in Manhattan? today that same boxcar home would rent for $2,000 a month! Somebody please send this idea to FEMA. Similar to what was described in The Grapes of Wrath — but I had no idea that it was taking place in Manhattan too. 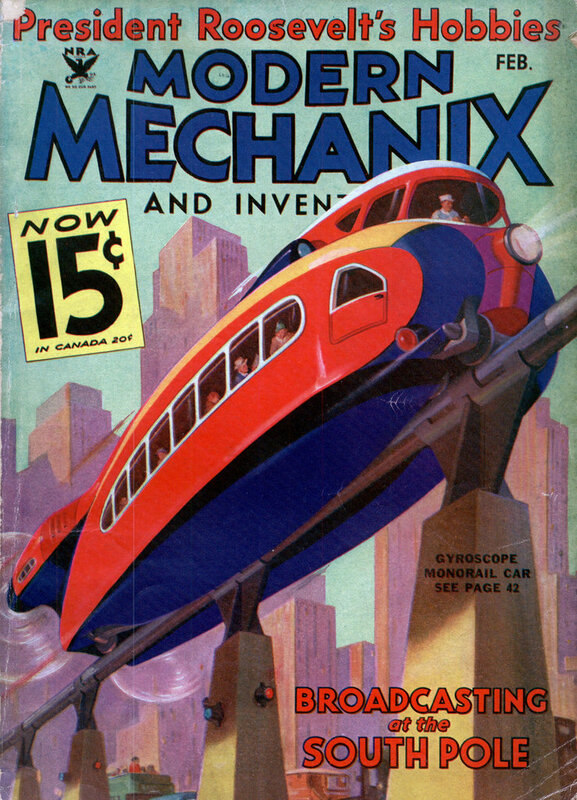 I suppose the modern version of this would be to use shipping containers. No the modern version would be to use old airliners. I saw a news piece a few years back on box car homes and they were just beautiful! Complete with a small bedroom, bath living/dining area and C/H/A. I think someone had bought this particular one featured and redone it themselves for under a few thousand. Can you imagine HOUSING a couple or small family, even temporarily, for under a few thousand. Low electric/water bills, nearly non-existant rent?!? Would be perfect for low-income people who need a decent place with cheap rent to stay while they save for something bigger. FEMA dropped the ball on this, as usual. My wife and I have heard of this village in our research. We have a boxcar home and would like any information you can give. Lance: Wild! I saw one this summer on the Canadian side of Lake Erie somewhere (I should have got a photo.) I wasn’t sure if it was in current use. Yours isn’t on rails somewhere, is it? Boxcar Bertha lives there. If you see her, say hi for me.